I imagine she *will* be available, since the other ponies are, and I'd imagine they all have the same copyright agreements and everything with BABW. It might be because she's so new, maybe wait a day or so and try again? Then maybe contact vwhelp if the code still doesn't work. hmm that's weird, I would try what Meghan said. Keep us updated! My friend's Fluttershy code is still giving the open choice screen, too. Guess the waiting game continues. Thank you for posting when we could try to adopt Fluttershy again. I hope it doesn't say that I used my code already (I X'd out when I saw she wasn't available when adopting her). I guess I will wait to adopt my Christmas pets too, since I want all 4 ponies together on the same room page in my cub condo! I just tried again to bring Fluttershy to life on BABV. As of 6:54am EST Sunday morning I was still offered an open code, so the problem isn't fixed yet. I-I thought I was the only one! Looks like we won't be getting Fluttershy online after all. 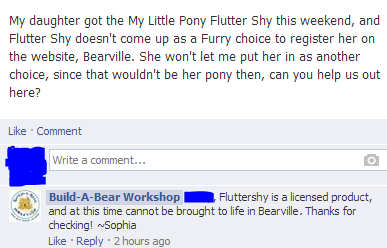 I understand that there are copyrights and licenses involved, but why would they be able to have 3 ponies in Bearville, but not Fluttershy? I would think they're all owned by the same company and people, therefore BABW would have the same rights for each of them? I could be wrong though, I'm not an expert with copyrighting and things like that. I think they probably just screwed up on the communication, because I sometimes get different answers from different reps on the same situation when I write to vwhelp. And she must be online, both for the reasons you gave, and the fact that someone else said they saw her PSI already. 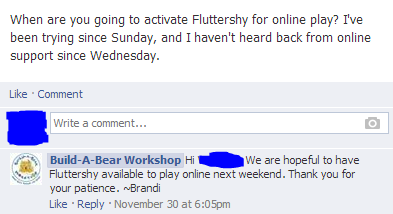 I think they're just being ignorant about anything Build-A-Bearville-related again. Fluttershy is copyrighted by Hasbro who own Twi/Dashie but those two can be activated ( saw a twilight getting activated last night) but flutters cant?